A company owned by the family of Jared Kushner, President Donald Trump’s son-in-law, has abandoned plans to buy a sprawling industrial site in New Jersey from Honeywell International Inc., a major federal contractor, and develop it into a residential community. 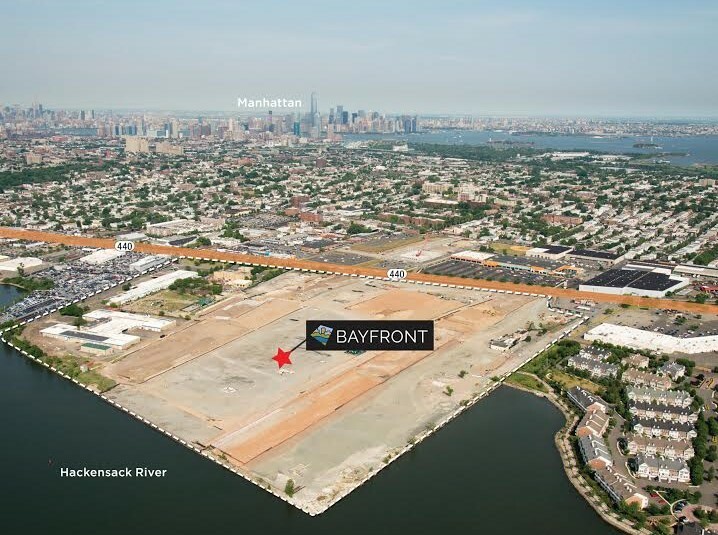 Kushner Cos. had been the leading bidder for the 95-acre formerly contaminated site known as Bayfront, which is co-owned by Honeywell and Jersey City, city officials said. The company had submitted plans to build as many as 8,100 housing units to be marketed to Orthodox Jewish residents of the Williamsburg section of Brooklyn who are being priced out of that neighborhood. Last fall, the Kushners bid about $150 million, tens of millions higher than competitors, according to people involved in the negotiations. Honeywell heard from others who would only make an offer once the environmental approvals for the cleaned-up site were final. So the bidding is scheduled to reopen later this year and Kushner Cos. had been expected to continue in the process, the people said. But on Tuesday, when Bloomberg News asked about Bayfront, company spokesman James Yolles said the Kushners are no longer pursuing the project. He wouldn’t elaborate or explain. A Kushner official who asked not to be named said the company dropped its plan late last year. However, others in the negotiations say they have been in contact with the Kushners in recent weeks with no indication of a change of heart. Mark Albiez, chief of staff to Jersey City Mayor Steven Fulop, said the administration had not received any notice of the withdrawal of the Kushners’ bid. The move was welcome news to ethicists. Jared Kushner, who is married to Trump’s daughter, Ivanka, has sweeping power in the White House as a senior adviser. Although he has pledged to recuse himself from potential conflicts and sold many assets, some of those sales have been to trusts controlled by family members. Honeywell has billions in federal contracts, and development of the site probably would involve a range of federal funding requests for infrastructure improvements to roadways and nearby light-rail lines. Kushner Cos.’ withdrawal from the Honeywell negotiations comes as the family faces pressure for the entanglements inherent in its business-expansion efforts. Last weekend, Kushner Cos. executives held meetings in two hotel ballrooms in China, trying to raise money for a separate and troubled Jersey City construction project. Part of the money will come from a controversial program that provides visas to investors. News coverage of that effort spurred criticism of the company. Mayor Fulop linked to a story about the Chinese fundraising when he announced Sunday that the city rejected the family’s application for tens of millions in city tax breaks on the project. And in March, a Kushner plan to refinance its financially struggling office tower at 666 Fifth Avenue in Manhattan collapsed after news reports revealed the proposal involved billions of dollars from Chinese conglomerate Anbang Insurance Group Co., which has close ties to the ruling party. In Jersey City, a liberal Democratic stronghold, Kushner Cos.’ close connections to Trump have sparked protests, causing problems for its projects in the community and complications for Fulop. A Democrat running for reelection this November, he has been criticized for his warm relations with both Jared Kushner and his father, Charles, chairman of the family’s real- estate ventures. As the Kushners were developing Trump Tower in Jersey City in 2014, they hired one of Fulop’s closest political strategists to work as an expediter on the project. Kushner Cos. and its executives also donated to various funds that supported Fulop’s re-election campaign this year and brief run for governor last year. Bill Matsikoudis, Jersey City’s city attorney and a Democrat running against Fulop this year, said Kushner Cos.’ withdrawal from the Bayfront project is good news for taxpayers. Albiez, Fulop’s chief of staff, rejected allegations that his administration gave the Kushners favored treatment. The Kushners’ withdrawal takes them out of the running for a potentially lucrative project. Similar efforts in the New York City area have been goldmines for some developers. In Brooklyn, David Walentas bought up 2 million square feet of dilapidated industrial buildings on the waterfront and minted a billion-dollar fortune by converting them into an upscale neighborhood of cobblestone streets, art galleries and boutiques now known as Dumbo. Stephen Ross, already one of the world’s richest men, created Hudson Yards, a 28-acre project including the site of a former rail yard on Manhattan’s far-West side, abutting the Hudson River. Jersey City’s plans for the site are grand, and could include housing for as many as 20,000 residents, 1 million square feet of office space and 600,000 square feet of stores. Last year it granted $2 million in tax breaks to Honeywell for the construction of three parks. The site, which runs along the Hackensack River on the west side of Jersey City, became contaminated in the first half of the 20th century, when Mutual Chemical Company used it to dump what was then known as chrome ore processing residue, a byproduct from making stainless steel, from a nearby plant. What happened to National Wholesale Liquidators? And "Asian Food". Has anyone told Donald Trump they are putting a wind farm next to the golf course? A Honeywell project to build 14 acres of parks in the planned Bayfront community on the west side of Jersey City will receive $2 million in state tax breaks. The state Economic Development Authority approved the deal yesterday. The $29 million Honeywell project will result in three parks — dubbed Central Park, the Promenade and the Green — at Bayfront, the massive residential community planned for the western waterfront. When completed, Bayfront could consist of up to 8,100 residential units, up to 600,000 square feet of retail space and up to 1 million square feet of office space. Construction is expected to begin after Honeywell finishes ridding the 100-acre site of chromium. The clean-up is scheduled to be completed this year. The EDA grant, which comes in the form of tax credits to be granted after construction is completed, is being criticized by the New Jersey Sierra Club. Jeff Tittel, its director, called the grant a "toxic deal." A 95-acre land parcel on Jersey City’s West Side is coming to market, and Cushman & Wakefield’s Metropolitan Area Capital Markets Group has been retained as the exclusive agent for its sale. The fully zoned and master planned site on the eastern shore of the Hackensack River is assembled and ready for transit-oriented, mixed-use redevelopment. Known as Bayfront and located in Jersey City’s 1,344-acre Bayside Development Zone, the property will incorporate new housing, office and retail uses with public waterfront access and more than 20 acres of open space. “This is an incredible opportunity for an investor to secure the largest development site left within New Jersey’s next Gold Coast market, where developable land is highly sought after and limited opportunities remain,” noted Cushman & Wakefield’s David Bernhaut, who is heading the assignment with Metropolitan Area Capital Markets Group team members Andrew Merin, Gary Gabriel, Brian Whitmer, Leslie Smith, and Ryan Dowd. Bayfront, which was supported unanimously by the City Council in 2008, builds on the work of Jersey City community members, business owners, academics, residents, and elected officials to create an integrated mixed-use vision for Jersey City’s West Side. The plan focuses on building a community appropriate for the location while adopting the principles of smart growth, transit orientation, green design, walkability and sustainability. Its execution will be market driven, allowing for up to 8,100 residential units, one million square feet of office and 600,000 square feet of retail. The site will be delivered graded to allow for the development of building pads. The Hudson-Bergen Light Rail system stops at West Side Avenue a few blocks from the site, with future plans to connect directly to the Bayfront development, providing direct access to Manhattan via the PATH system. Bayfront also offers easy access to a well-established and expansive mass transit system and roadway network that will connect residents to the rest of the Tri-State area. When completed, Bayfront will join existing West Side development projects like Droyers Point and Society Hill as well as those currently under development, including New Jersey City University’s West Campus located directly across Route 440 from Bayfront. It isn't clear that anyone will want to live on formerly contaminated land in an industrial neighborhood. JERSEY CITY—Not long ago, city officials here and Honeywell International Inc. were at war over the fate of more than 100 acres of chromium-contaminated land on the city's gritty western edge. Now they are development partners. A rendering of development plans for the area in Jersey City to be cleaned up by Honeywell. .The city and the Morris Township-based technology and manufacturing conglomerate want to develop an old industrial dumping ground into a sprawling new neighborhood called Bayfront on the shore of the Hackensack River. Its up to 8,100 residential units, one million square feet of office space and 20 acres of parks and plazas are still far from reality. Ground won't break until 2016 at the earliest, and no one expects the project to be finished before 2040. But it took an important step forward last week when NJ Transit began an environmental assessment of a crucial element of the plan: extending the Light Rail 3,700 feet to connect Bayfront to the rest of the region's public transit. NJ Transit said Monday it is behind the project. "An extension of the light rail to this area would both support the development and address traffic congestion along Route 440," a nearby highway, said spokeswoman Nancy Snyder. To be sure, Bayfront's success is uncertain. Transit authorities say the Light Rail extension would cost about $213 million, it would cost the city and Honeywell more than $80 million to move two large facilities to make way for the project, and Honeywell has spent $500 million to clean up the site and will have to spend an estimated $50 million in addition. Close.The project's progress will be closely watched—locally as a measure of another Jersey City attempt at revitalization and nationally as a test of Honeywell's ability to make it in the real-estate business under its unusual deal with the city. "The reality is most industrial companies don't want to be in real-estate business. It's typically not a comfortable fit," said Mary Hashem, an executive vice president at Brownfield Partners, a real-estate development firm that specializes in contaminated sites. Honeywell—primarily a maker of aerospace, building control and safety products—has been involved before in the redevelopment of several contaminated sites around the country, including Inner Harbor in Baltimore and El Segundo, Calif. Participating in the redevelopment could help improve its image in the community and potentially make back some fraction of the cost of the clean up. They would also be able to oversee the redevelopment to make sure it is done responsibly. Rick Kriva, Honeywell's vice president for global real estate, said the main motive of the company—which has 1,700 employees in New Jersey—is to help rejuvenate Jersey City. "Honeywell is an important part of the community. We feel that this is the right thing to do," Mr. Kriva said in an interview. The project has drawn criticism, including from Jersey City Mayor Jerramiah Healy's potential re-election opponent, Steven Fulop, a city councilman. In the current economic and political environment, Mr. Fulop said the project is unlikely to get the funding it needs from cash-strapped state and federal governments for the Light Rail component. He said it would likely have to be scaled back. "Nobody in the city wants to continue to see it be vacant, but at some point the city is going to have to potentially recalibrate how it's approaching that development with Honeywell," said Mr. Fulop. The site's history of contamination dates back to the late 19th century, when wetlands were filled in by chromium waste from a nearby plant owned by Mutual Chemical Co., which made the substance used as an anti-corrosive in shipbuilding, among other purposes. The plant closed in 1954. The slag was covered over with gravel. On top of the slag were built the Valley Fair Department Store, a drive-in movie theater and other small businesses. The trouble became clear in the 1980s when the walls of the department store began to crack from the chromium heaving underneath. The buildings were vacated, and the site largely has been abandoned ever since. Honeywell took over in the late 1990s when it merged with the site's former custodian, Allied Signal, an equipment manufacturer. In 2005, the city decided to make a move, suing Honeywell to clean up the site and for up to $80 million in lost tax revenue. They settled in 2008 after agreeing to develop the area together. "This is something that started out as litigation and a dispute, where we were simply seeking to compel Honeywell to clean up this chromium and to get this revenue," said William Matsikoudis, an attorney for the city. "It evolved into this public-private partnership to create a transformative development on our city's west side." Now, the city and Honeywell are working out the project's design, which would include two large parks. When the site is sold to developers to carry out those plans, they would split the estimated $100 million to $300 million: 60% for Honeywell and 40% for the city, based on how much land each contributed. Mr. Healy, Jersey City's mayor, talks of creating a "green coast" on the city's west side that would rival what he sees as the successful revitalization of the city's east side. The site is one of the largest and most polluted of dozens of chromium-contaminated sites in Jersey City's 15 square miles. "What was once highly toxic brownfields will become…residential neighborhoods, significant open space and community features," Mr. Healy said in a statement. Environmentalists see the project—should it ever be completed—as a boon not only for the city but for the Hackensack River, a neglected body of water with a history of heavy pollution. "It's going to be a real improvement over the broken-down, post-industrial landscape that's dotted the river there for the last 30 years," Bill Sheehan, of the Hackensack Riverkeeper, an environmental group. Honeywell International Inc. has spent $500 million to clean up a contaminated site in Jersey City and will have to spend an estimated $50 million in addition. An earlier version of this article incorrectly implied Honeywell still needs to spend $500 million to clean up the site and a future development would be built on still-contaminated land. Up to 8,100 residential units. As much as 1 million square feet of office space. Some 23 acres of open space. Those are just some of the proposed features of Bayfront, a transit village set for 100 acres of chromium-tainted land along Route 440 in Jersey City. City officials hope their success in developing Jersey City’s eastern waterfront can be replicated on its West Side. Captain Bill Sheehan, of Hackensack Riverkeeper, an environmental organization, said Bayfront will give the city “a real shot in the arm.” Sheehan was on hand earlier this month for a City Council caucus at which city officials presented the governing body with their latest plans for the 100-acre Bayfront, a project first dreamed up during the Glenn D. Cunningham administration. The development would sit on land formerly owned by Morristown-based Honeywell International Inc, north of Society Hill, along the Hackensack River. Last month marked the four-year anniversary since the city teamed up with Honeywell to create Bayfront. “Bayfront represents an extraordinary effort among numerous city officials and our partners at Honeywell to transform the West Side by making it safer and more attractive, while also creating substantial economic development, jobs, and tax revenue for our city,” Mayor Jerramiah T. Healy said in a statement. Chromium contamination at the site has its roots in the late 19th Century, when Mutual Chemical Co., a Honeywell predecessor, started piping chromium processing residue from its plant into the Hackensack River. Construction isn’t expected to begin until 2016, with initial occupancy beginning the following year. Though work is not scheduled to end until 2043, the city is already at work preparing the area for the massive development. City officials say much of the contamination has been remediated. The on-site headquarters for the city Department of Public Works and the Jersey City Incinerator Authority, meanwhile, will be demolished, as will a handful of other buildings used by the city and the JCIA. The DPW and the JCIA will move to a new East Linden Avenue complex, with construction on that facility expected to begin this year. Councilman Michael Sottolano, who represents Ward A, where most of the Bayfront property sits, has called the plans “dynamic.” “I don’t know if it’s all going to be done in my lifetime, but I sure hope so,” Sottolano said. Three companies responsible for the remediation of chromium sites in Hudson County have agreed to reimburse the state $15 million for work the state has done to clean up the sites, officials announced yesterday. Honeywell International Inc., Occidental Chemical Corp., and PPG Industries have agreed to pay into the fund as part of a legal settlement, said Department of Environmental Protection Commissioner Bob Martin and New Jersey Attorney General Paula Dow. Along with monitoring 126 earmarked sites, DEP officials said the settlement also assigns responsibility for the ongoing cleanup efforts at 42 local “orphan sites.” So far, no single company has been linked to these highly disputed sites. As part of the agreement, Honeywell will pay an extra $1 million for the current efforts at a toxic site in Jersey City. “This was an important step to resolve the legacy of chromium contamination in Jersey City by the generators of chromium contamination accepting responsibility for the so-called ‘orphan sites’ for which the identity of the contaminator could not be determined,” said Jersey City Corporation Counsel Bill Matsikoudis. But Jeff Tittel, director of New Jersey Sierra Club, blasted the agreement. “Not only do we let them (the corporations) off the hook without properly cleaning up their sites, we are now settling for pennies on the dollar with this deal for $15 million,” he said in a statement. Honeywell spokeswoman Victoria Ann Streitfeld said her company looks forward to “listening to the Jersey City community” as it completes its work. In 2009, Honeywell completed cleanup efforts at the former Roosevelt Drive-In site off Route 400 in Jersey City and the former Foodtown site on Ocean Avenue, she said, adding that by the end of July, remediation efforts at New Jersey City University’s new West Campus will also be completed. The state’s lawsuit was filed in Superior Court in May 2005. The settlement will need the approval of Superior Court Judge Thomas Olivieri in Hudson County. This was the best topic that I found to put this bit. The Leonard Lopate show on WNYC yesterday had a segment about the clean-up and lawsuit. In the 1982 the State of New Jersey began investigating the presence of the dangerous chemical hexavalent chromium on a 16-acre site in Jersey City. Today, the site remains contaminated. We’ll talk to Nancy S. Marks, senior attorney for the Natural Resources Defense Council, about why it’s taken so long to clean up the site and why the NRDC filed a new lawsuit in February to enforce the clean-up effort. As part of the settlement struck earlier this year between Jersey City and Honeywell International, roughly 35 acres of city-owned land were transferred to the Morristown-based company last week. In return, Jersey City received an eight-figure check. The property, along Route 440, is home to the city's Department of Public Works and the Jersey City Incinerator Authority and is supposed to be part of new community the city is building with Honeywell's help on the west side. As part of the settlement, Honeywell has agreed to clean up and sell development rights for roughly 100 acres of chromium-tainted land. Based on the city's land contribution, profits from the development rights will be split with the city on a 60-40 basis, with the city receiving 40 percent. At the closing on Friday, the city received a $15 million advance on those profits, which is being used to avoid a tax hike in this year's budget. City officials intend to relocate the DPW and JCIA, and shrink the size of the adjacent Municipal Utilities Authority. The city is looking at two privately-owned sites to relocate the agencies -- a chunk of land at the old PJP landfill site under the Pulaski Skyway and a property along Commercial Street. In the meantime, the city will pay Honeywell $100 a month to rent space for the DPW and JCIA at their current locations. Beginning July 1, Honeywell will pay conventional taxes on the properties, officials said. The overall agreement calls for the chromium cleanup to be completed by 2011. A recent settlement agreement between Jersey City and Honeywell International has brought to light that for the past three years, employees at three city agencies were being offered annual tests to find out if they have elevated levels of chromium in their urine or blood. The tests, which are voluntary, are being to offered to roughly 330 employees at the Jersey City Department of Public Works, the Jersey City Incinerator Authority and the Jersey City Municipal Utilities Authority - all located along Route 440 on chromium-laced land. The tests began in fall 2005 when under court order, Honeywell began excavating chromium-contaminated soil from a site next door to these agencies - a 32-acre plot known at the Roosevelt Drive-In site. According to city officials, 179 employees took the initial urine test in 2005 and 77 employees have taken it since. Three of these workers showed elevated levels of chromium in their urine, said city spokeswoman Jennifer Morrill. Two of the three employees opted not to take a follow-up urine test, and the third tested normal, Morrill said. The city cannot compel employees to take the free test, but flyers are posted in breakrooms and attached to paychecks prior to the testing dates, Morrill said. Honeywell pays Teichman Occupational Health Association of West Orange to perform the tests. The city does not do an independent review of the results, city officials said. "I personally wanted to know I wouldn't have it (elevated levels of chromium) in my system," JCIA employee Bob Lynch said last week. "My results came back okay." Jan Katz, business agent for Teamsters Local 641, which represents roughly 65 JCIA employees, vouched for the "professional way" the tests are done. "I made sure my people could go and be tested any time they wanted to," Katz added. The land the three agencies sit on is being folded into the larger redevelopment plan for the area. As a result, the JCIA and DPW will have to move, and the JCMUA will be rebuilt to take up less space, city officials have said. 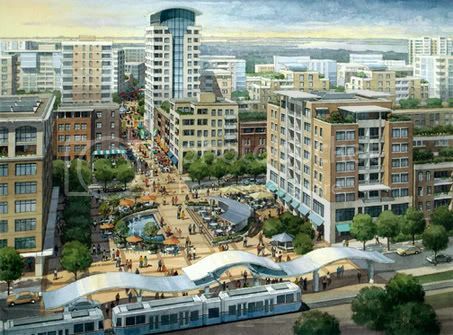 The Planning Board unanimously approved Honeywell's and Jersey City's vision to turn 100 acres of chromium-contaminated land on the Hackensack riverfront into a mixed-use development for tens of thousands of residents, workers and park visitors. Project designer Anton C. Nelessen, of A. Nelessen Associates, outlined the Bayfront I Redevelopment plan that would replace old industrial buildings, vacant land, a concrete plant and the city's public works with homes on tree-lined streets, shops, restaurants offices, parks and a waterfront walkway. The plan calls for up to 8,100 residential units, one million square feet of office space, 600,000 of retail space and 12,000 parking spaces. The Hudson Bergen Light Rail would be extended from the West Side Avenue Station, bringing the entire area within a 10-minute walk from a station plaza on the northern end of the site, Nelessen said. Incorporating an environmentally designed plan to cut back on energy and water consumption, the development would include green roofs and a network of bicycle paths. Parking would be incorporated into the buildings, avoiding street parking. Two blockwide parks, listed on renderings as Central Park and the Promenade, would cross the width of the site from a new boulevard along Route 440 west to the waterfront, with space available for playgrounds, dog parks, ball courts, a grass amphitheater and other amenities. The development area stretches from Route 440 to Hackensack River and from the northern edge of Society Hill at Kellogg Street to Culver Avenue. It is just part of a 1,344-acre Bayside Development Plan, completed in 2003, designed to revitalize the west side of Jersey City. Would you buy a house and raise kids on land that was supposedly cleaned up? I probably would not raise kids on that land. But I don't have any sympathy for people who would buy there and raise kids there. NJ toxic sites are well-documented, and a small amount of diligence in advance of making a purchase would turn up enough information upon which to base a rational decision on whether to buy there. It's not the developers job to do anything above and beyond what's required by law, provided they make no misrepresentations about the status of the land. The market will dictate how much those units will sell for, and one of those factors will definitely be the toxicity of the land. Plenty of people would take the risk, just as there are plenty of people without kids looking for places to live. They say: "The question here is when will there be any time for any substantial public input?". New development along the Newark Bay side of Jersey City is always welcome. The tentative settlement with Honeywell International Inc. is expected to spur construction of housing, office buildings and shops on about 80 acres and provide more open space on nearly 20 acres. This newspaper has editorialized that on the surface it appears to be a good deal. What sends up a small red flag is the speed at which this settlement and major development project was rammed through the City Council, whose members hardly asked a question but nevertheless unanimously approved the agreement. This deal was supposedly negotiated over the course of a year. Yet, the public announcement about the proposed development and the agreements between the city and Honeywell, and then the council's vote, all took place in less than one week. The question here is when will there be any time for any substantial public input? Will it be during Planning Board sessions when Honeywell sells property to potential builders - after the financial considerations in the agreement are completed? Honeywell is expected to buy the 41 acres of city land currently occupied by the DPW, the Municipal Utilities Authority and the Incinerator Authority, and then sell - after a chromium clean-up - this land and roughly 60 acres the company already owns, to builders who agree to follow redevelopment plans drawn up by the city. Members of the public did not have enough time to question this deal. Where are the DPW, MUA and Incinerator Authority being moved? Apparently there is no plan for such a move, because Ward B Councilwoman Mary Spinello objected to plans to move these government facilities to the Marion section of the city. Now the MUA will stay where it is, but it will be rebuilt as a streamlined facility. The other two have yet to find new homes. Perhaps the reason city officials want to expedite the agreement is that there is a hole in the city budget that has to be closed. Quarterly tax bills have gone out and there are some angry homeowners. The Healy administration wants to repair the damage, and this deal will do it. Honeywell has agreed to upfront payments of $15 million this year and $10 million next year, money that would come out of the city's 40 percent share on the land sales to developers. Development on the west side can only help this city, but the administration should have given its citizens time to digest what is being offered. Huh, that last little bit is sketchy -- kind of makes the whole deal questionable, i.e. was this the best possible plan for the city, or did they (partially) do it to plug the budget hole. And that rendering is ridiculous. This deal also offers an immediate payoff for an administration trying to cope with this year's budget that ends June 30. A rendering of a development project that was approved Wednesday night. The Jersey City City Council has approved a tentative settlement with Morristown-based Honeywell International Inc. that promises to spur the development of thousands of housing units, plus commercial, retail, and open space on the city's west side. The deal, negotiated over the course of a year by city officials, settles at least three lawsuits filed by the city against Honeywell and a counter-suit against the city filed by Honeywell, the successor company to Mutual Chemical, which polluted roughly 100 acres of land with chromium, a known carcinogen. "I look forward to the west side of the city being developed," said Ward D Councilman Bill Gaughan, joining with colleagues Wednesday to unanimously approve the agreement. "This is a landmark project." City President Mariano Vega called the deal, which still must be approved by the state Department of Environmental Protection and the courts, a "historic settlement." The biggest initiative of Jersey City Mayor Jerramiah Healy's administration, the deal would spur up to 8,000 units of housing, along with more than 1 million square feet of commercial and retail development. Twenty of the 100 acres would be open space. Honeywell would be named the "master redeveloper" and charged with cleaning up the tainted sites and selling development rights. The city, which owns 41 of the 100 acres, would reap 40 percent of the revenue from land sales. This amounts to $60 million to $150 million coming into city coffers over the 20-year period, city officials said. When fully built, the project will contribute $50 million a year to taxes, officials said. Initial plans called for relocating the Jersey City Incinerator Authority and Department of Public Works to land owned by Edwin Seigel at the PJP landfill site. But Ward B Councilwoman Mary Spinello objected and the city is looking at alternative sites. Honeywell is chipping in $13 million toward relocation, officials said. The Municipal Utilities Authority, also located on the tainted land, would remain on site, but it would be rebuilt to take up less space, officials said. Honeywell has agreed to upfront payments of $15 million this year and $10 million next year, money that would come out of the city's 40 percent share on the land sales. The contaminated site of which they speak is that fenced off area across from Home Depot. Isn't this where the mayor wanted to build a warehouse or is that somewhere else? No, the AMB warehouse project is north of Duncan Avenue along the Hackensack waterfront. No that's by Duncan Ave opposite the golf range and the projects (not many places where you can write "golf range" and projects" in the same sentence). Jersey City Mayor Jerramiah Healy urged City Council members Monday night to approve a tentative legal settlement tonight with Honeywell International Inc. - a deal the mayor says will jump-start development of 100 acres of chromium-contaminated land on the city's west side. "We're opening the doors to great things," said Healy, as he ticked off benefits of the agreement, including up to 8,000 housing units, 1 million square feet of retail and commercial space, 20 acres of open space, and when fully built in 20 years, $50 million a year in taxes. The tentative settlement resolves three lawsuits filed by the city against Honeywell and countersuits filed by Honeywell, which absorbed the company that originally polluted the land. The agreement, which the council will consider at its meeting tonight at 6 at City Hall, calls for the city to pool 41 acres it already owns with 60 acres already owned by Honeywell. Honeywell would sign a "master redeveloper's agreement" to sell this land to builders who would develop it according to an "areas in need of redevelopment" plan formulated by the city. Honeywell's share of the land sales revenue would be 60 percent and the city's 40 percent. This division is based on the percentage of land contributed, city officials said. The city stands to reap between $60 million and $156 million, city officials said Monday. The deal calls for Honeywell to dig up and remove chromium-tainted soil on the 80 acres slated for residential and commercial purposes. In accordance with state Department of Environmental guidelines, the 20 acres of open space would receive a synthetic, impermeable cap. As result of a 2005 settlement with the community group, Interfaith Community Organization, Honeywell is already excavating contaminated soil from a 34-acre plot known as the Roosevelt Drive-In site. Joe Morris, ICO's director, slammed the city and the DEP for being party to a deal that allows some chromium to remain on site. "We're disappointed that DEP is implementing this policy with such broad loopholes, such as open space," Morris said. "The result will be lots of cancer-causing chromium remains in the ground." Bill Matsikoudis, the city's top attorney, shot back that the city's environmental consultants signed off on the plan, as have lawyers and consultants representing the Hackensack Riverkeeper, who also sued Honeywell and is on the brink of settling.